Managua, Nicaragua – Bullet holes still pock the white walls and roof of the church where the Reverend Edwin Roman Calderon sheltered bleeding anti-government protesters last year after police and paramilitary fighters attacked demonstrators in streets of Masaya in western Nicaragua. 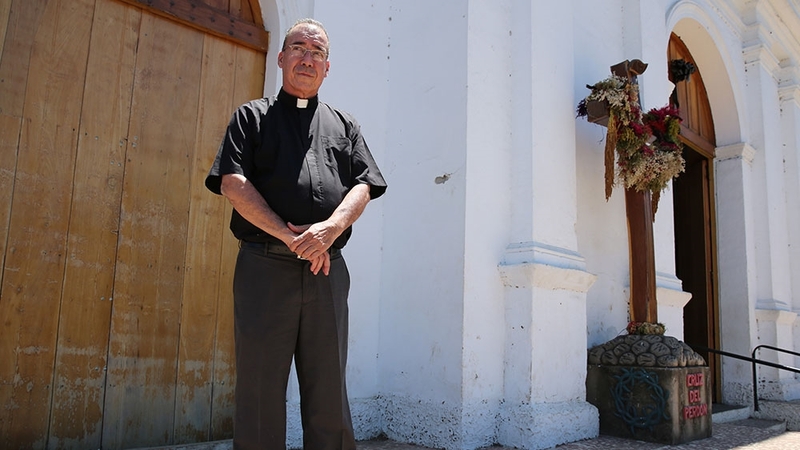 The deadly violence that turned his church into a morgue has ebbed since President Daniel Ortega‘s violent crackdown last April sparked Nicaragua’s worst political upheaval in decades. Despite some hope from recent peace talks, Calderon, 59, who became a target of government harassment and intimidation, said the crisis still has a stranglehold on his country. “There’s a lot of pain. There are people in other countries, without a job, mothers who are by themselves suffering lost sons or husbands, people still in prison,” he said. As Nicaragua nears the one-year mark since its political turmoil began, pressure from international sanctions and a growing economic crisis has helped push Ortega to accept several key opposition demands in recent weeks. That has included promising to release 640 remaining political prisoners within 90 days and easing repression of protests and free speech. Foreign Minister Denis Moncada also recently rejected early elections before those planned for 2021, which the opposition group Civic Alliance said was critical to talks that have since faltered. And just one day after agreeing to respect free speech, police squelched protest and made arrests in Managua, generating scepticism and uncertainty in advance of the anniversary. The protests started in April 2018 over a since-scrapped social security reform proposal. But the violent crackdown, which a United Nations report in August said included extrajudicial killings, arbitrary detentions and torture, set fire to long-building discontent with Ortega. The former leftist rebel leader’s last 12 years in office saw economic gains but was increasingly viewed by critics as becoming increasingly authoritarian including consolidating power by getting the courts to allow him additional terms and the national assembly to scrap term limits. He made his wife, Rosario Murillo, the vice president. US Senator Marco Rubio, a critic of the regime, said late last month through his press office that sanctions would continue if Ortega “intends to use these negotiations as a farce and opt to continue to violate the rights of Nicaraguans”. 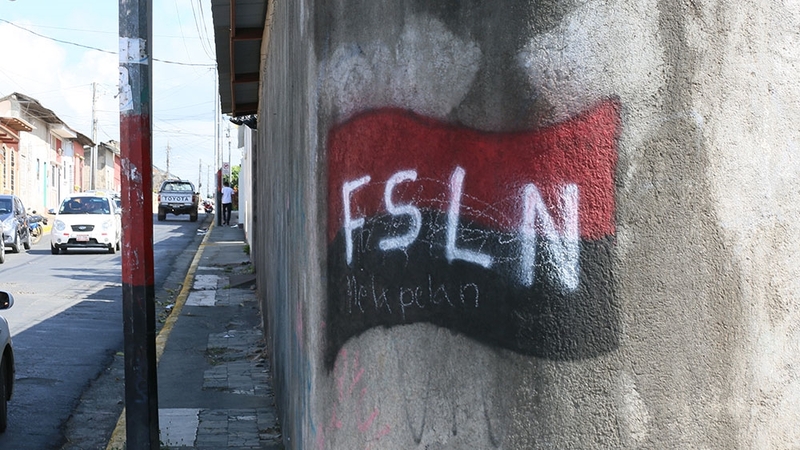 Meanwhile, signs of crisis remain visible in Nicaragua: Red-and-black Sandinista graffiti reading, “My commander stays” duel with white-and-blue colours of the opposition calling for his resignation. Heavily armed police at times gather along roads to keep protests at bay. Families tend graves of those shot by snipers during protests. In the centre of the colonial city Granada, some hotels were half empty amid a decline in tourism. Prominent human rights lawyer Julio Montenegro, who represents protesters the government has jailed as “terrorists” and handed some draconian prison sentences, said the crisis has cut a swath of “extreme hardship” through many residents of the hemisphere’s second-poorest nation. More than 700 have been imprisoned, 325 killed and nearly 2,000 injured, according to the Inter-American Human Rights Commission. More than 20 police officers also died, a UN report found. Students have been expelled from universities and teachers, doctors and others were fired from jobs in retaliation. In addition, an estimated 62,000 fled to other countries including Costa Rica. Caracas is among those living in San Jose, where she said many are struggling to afford food and housing, living in refugee centres or in poor neighbourhoods on the outskirts. Only a fraction have gotten work permits, she said. Nicaragua’s government said recently it would implement a programme to guarantee the safe return of exiles who did not face charges or court cases, but opponents dismissed the proposal saying few would trust the government. “If Ortega completely disappears, probably I will return to my country,” said Daniel Reyes, 47, who fled to the United States after he saw his 20-year career as a microbiology professor collapse when he was fired from the Autonomous University of Nicaragua in Leon for demonstrating. He hid for months, dodging police and paramilitaries looking for him, before his wife encouraged him to flee to Miami in December. “My family was very scared,” said Reyes, whose visa does not yet allow him to work. Ortega has said he’ll allow the International Red Cross to propose a list of prisoners who should be released by mid-May. So far, only a trickle have been released, some to house arrest. Some families with jailed family members are sceptical and say it won’t diminish their opposition to Ortega. “What the government wants from the talks is more air” to remain in power, said Juana Lesage, whose three sons remain in prison since last summer after marching in the city of Jinotepe, south of Managua. The government has not yet reopened shuttered media outlets including 100% Noticias channel and the publication Confidencial, despite indications they would be allowed under the agreements. Alvaro Navarro, a journalist for the online publication Articulo 66 and a former staffer at Confidencial, recalled how he’d been caught in gunfire and faced threats during an interview in a small newsroom set up in an unmarked building with high security. 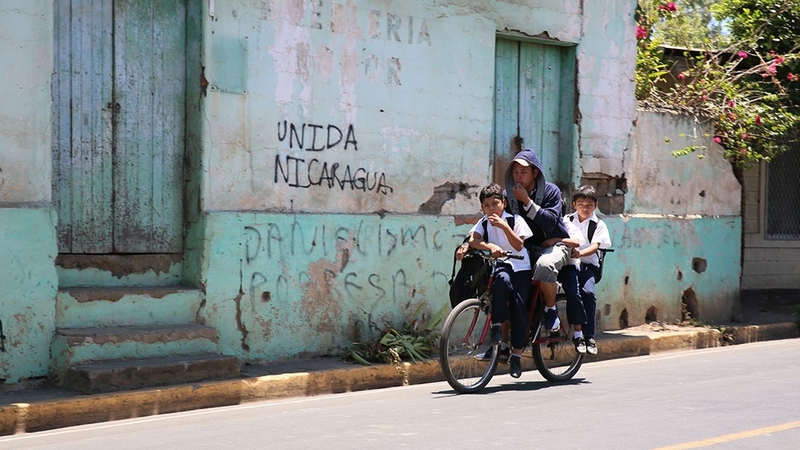 Amid the unrest and political uncertainty, Nicaragua’s economy shrank by nearly four percent last year and that could a reach seven-to-11 percent decline in 2019, according to a projection by the Nicaraguan Foundation for Economic and Social Development. Vidal Reyes, a construction worker who fought the Contras during the 1980s, said his once steady work sanding concrete on foreign-funded buildings has all but stopped. That has made the loss of his stepson who died last May – he believes at the hands of pro-government forces after attending a protests – all the more difficult. Like thousands of others, the struggle and despair have increased his desire to see Ortega step down. “A real Sandinista knows the evil (Ortega) is doing is not right,” he said. Last month, the first protests erupted in Managua since they were outlawed last fall. Called by the National Blue and White Unity movement, they ended with more than 100 arrests and attacks by paramilitary groups. Since then, smaller, shorter student protests are still popping up around the capital of Managua. And more are planned this week. Before the one-year anniversary, UN High Commissioner for Human Rights Michelle Bachelet on Tuesday in a statement that she was “concerned that the protests planned for later in the week may trigger another violent reaction” and urged government restraint. Ultimately, “pressure from international governments” driven partly by continuing protests, could help force Ortega to agree to early elections despite promises of electoral reforms, said Marlen Chow, a 69-year-old sociologist and former Sandinista revolutionary who is now an opposition figure after two arrests. “The goal is to not get to 2021,” she said. The unrest, Caracas believes, has pushed Nicaragua into new territory where residents are less willing to accept corruption or injustice and see civil protests as a way to achieve change. Still, the crisis last left lasting scars. In Masaya last month, Calderon sat in a rocking chair on a patio at his residence that adjoins the church. He recalled the fighting last spring and summer, including the so-called “Operation Cleanup” in July which saw arrests and deaths, and confrontations with police leaders in the square outside. Other Catholic leaders such as Silvio Baez the auxiliary of Managua, have called out what they view as human rights violations. Calderon said his effort to support his community has meant being followed by paramilitaries revving menacingly on motorcycles and being falsely accused of crimes. “I’ve been a priest of 29 years. In the last year, I feel like I grew up. I am more conscious to reality,” said Calderon, who sees hope in the dialogue agreements but fears elections won’t be free and fair. Next articleThe suspect was being held on felony charges of premeditated murder. ViralNewses.com are provide real news at a time. India elections: Will farm crisis be PM Narendra Modi’s undoing? Last week New York City Mayor Bill de Blasio enacted an emergency order. Scott Walker of the Walker Brothers dies at age 76. "viralnewses.com" is your news, entertainment, music fashion website. We provide you with the latest breaking news and videos from all over the world.